This second novel in the Snow Like Ashes series was just as riveting as the first. Meira is settling into her role as queen of Winter, but being beholden to Cordell, is not how she see’s her future. Theron, Noam of Cordell’s son, and one of her love interest’s from the first novel, is still by her side, but do his future plans coincide with hers? Sara Raasch does a great job of telling the story from two different perspectives, Meira’s and Mather’s (the previous thought to be ruler, and her childhood friend), seeing their lives mostly separate, but their visions for the kingdom, similar. One of my favorite things about the first book, Snow Like Ashes, was the journey Meira and her companions went on, both physically, and also their journey of self discovery. 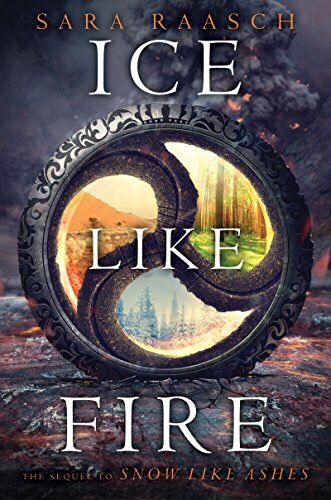 I was happy that both of these things are continued in Ice Like Fire. Meira in her new role, struggles, both internally and externally, and the reader feels her anguish over every decision, and is invested in the outcome. For me, Mather’s feelings over his new role were harder to read, but they were very effective in moving the story forward, so that the conclusion had even greater impact. The next novel, Frost Like Night, comes out on September 20th, and I am really eager to see what the future brings to these characters.